As a younger woman, around 26 or so, I moved in with my Gram due to unforeseen circumstances. She lived on 13 acres about 10 minutes from town. Country convenience she used to call it. 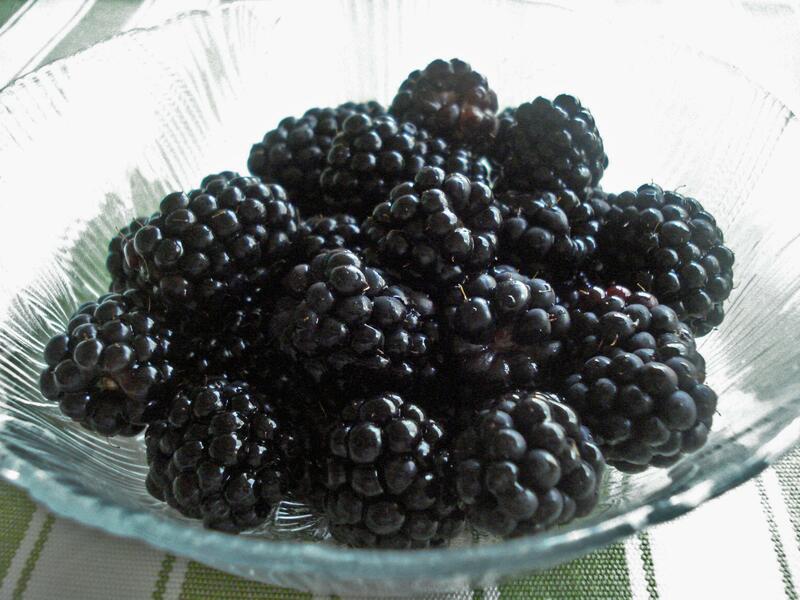 In early summer along the back acres there were lines and rows of blackberry and raspberry bushes ripe with luscious fat black and red juiciness. She’d send me out with a colander to collect enough for the three of us for dessert (My Grandpa Pat, too). Dutifully, off I’d trudge. When we got our berries this week, I dang near wept. They looked like one of the safest times in my life. They were bursting juice out of the containers as if they’d been styled by a food artist. Purple tartness pooling in the bottom of my bucket. I could hardly wait to gorge myself. But. I didn’t. Instead, I found a non dessert way to experience the tasty goodness of Blackberries. I found the recipe HERE. Season the pork chops on both sides with salt and pepper. Heat 1 teaspoon of olive oil in a skillet over medium-high heat, and pan fry the chops until they are lightly browned and no longer pink in the center, 2 to 3 minutes per side. An instant-read thermometer inserted into the center should read at least 145 degrees F (63 degrees C). Set the chops aside. Heat 1 more teaspoon of olive oil in the skillet, and cook and stir the shallots and thyme until the shallots start to become translucent, about 1 minute. Pour in the port wine, blackberry juice, chicken broth, and balsamic vinegar. Bring the mixture to a boil, scraping off and dissolving any brown flavor bits from the skillet into the sauce. Cook until reduced by a third, about 5 minutes. Mix cornstarch and water into a paste, and stir into the sauce. Cook until thickened, stirring constantly, about 1 minute. Reduce heat to low, and stir in the blackberries. Simmer until berries are hot. Return the chops to the skillet, and turn to coat with sauce. Serve hot, topped with sauce. This was incredibly flavorful with the rich blend of flavors dancing in a delectable sauce. OH BOY! I still had celery left from the last time. It was still crisp and fresh. Martha Stewart had a tip to wrap the celery tightly in aluminum foil and it keeps the celery the way we like it. But truthfully, I’m overwhelmed with celery. I thought it only for sticks that you put dips and peanut butter on as snacks. I never really thought of making other things with it being the primary ingredient. Here are a couple really easy ideas. HINT: If you’re going to make this cream soup, put together all the ingredients (you can also use vegetable stock which works just fine) but the milk and freeze. Thaw out the starter, add the milk to the thawed product and you’ll have “store” quality with homemade taste cream of celery soup. 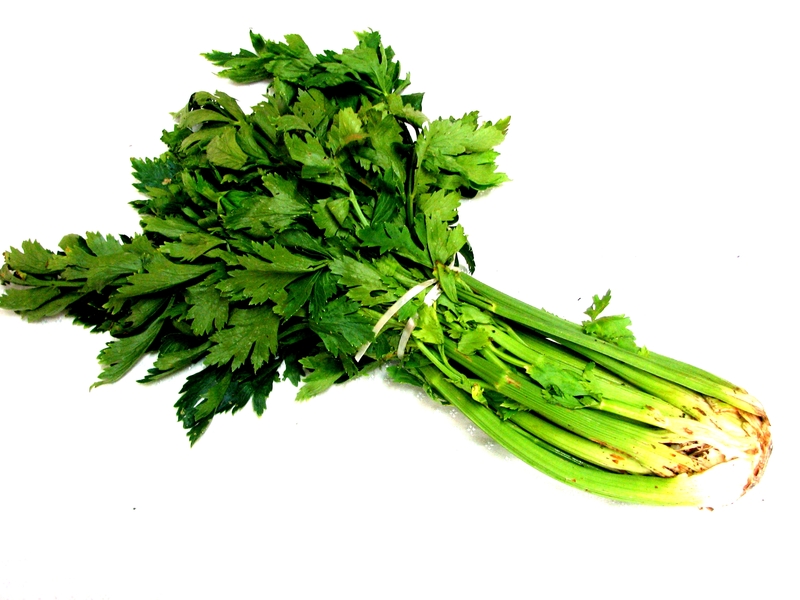 Further, keep in mind that this celery we’re getting is really fresh so the flavor is incredibly tasty. A little goes a long way, so adjust accordingly. Pour the chicken stock into a large pot, and bring to a boil. Add the celery, carrots and onion to the pot. Whisk together the flour, salt, pepper, and milk; add to the pot along with the margarine. Boil for 10 minutes, then strain out the vegetables by pouring through a sieve, or if the vegetables are large enough, a colander may be used. Arrange the celery in a single layer on the bottom of a large skillet. Season with salt and pepper. Dot with butter. Dissolve the bouillon cube in boiling water, and pour over the celery. Cover pan, and bring to a boil over medium-high heat. Reduce heat to low, and simmer for 30 minutes. Sprinkle with parsley before serving. This entry was posted in Business, Herb and Plow CSA Articles, Human, Personal, Prose and tagged blackberry, celery, cooking, csa, delicious, flavorful, garden, herbandplow, porkchop, recipe, savory.